The goal of the United States government for the last few years has been to resurrect the American economy. One of the main issues with the economy is the ever-growing deficit. There have been many ideas on how to handle the situation, but none that have been accepted by both Republicans and Democrats. President Obama has taken some time to himself these last few weeks. During that time, he has been looking over the big picture of the American economy. As a result, he has come up with a plan to decrease the national deficit by $4 trillion over the course of the upcoming twelve years. In short, Obama’s plan is going to cut back on spending by the government and increase taxes for Americans, but will not hurt programs like Medicaid and Medicare. Obama will be revisiting the issue of the tax cuts issued by former President George W. Bush. Obama wants to eliminate the cuts for families making over $250,000 per year. This is going to be a tough issue as we already know due to the strong support from Republicans for the tax cut to stay. In addition, whenever the deficit is on pace to go over 2.8% of the GDP, Obama is looking to issue spending cuts throughout the government funding programs. In his proposed deficit reduction plan, Obama asserted that by 2023, his Health Care Reform alone would save nearly half of a trillion dollars for the United States. In total, the Health Care Reform is projected to save a total of $1.5 trillion over the course of the next twenty-two years. 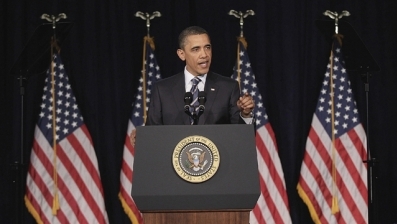 Obama is hoping that his plan can help Republicans and Democrats find a middle ground on the various issues they have. Republicans want to cut spending and are asking to essentially change the values that the United States has stood for since we all can remember. Democrats want to raise taxes and create a system where who your parents are plays less of a role into the success you might have in life. It should be expected that the two sides would be at each other’s throats until a final plan is settled, but Obama has laid out the best possible groundwork for the two parties to get to a final agreement with as little bickering as possible.